Is a Chicken in Charge of BURGER KING® Restaurants? MIAMI--(BUSINESS WIRE)--The executives for the BURGER KING® brand have finally admitted that the Chicken Fries phenomenon is bigger than they are. They can’t keep up with insatiable fanatics, knowing whole-heartedly that every time Chicken Fries reappear on the menu, fans rush out and quickly buy them up. Consequently, they have decided to hand off all Chicken Fries-related affairs to an ever-so-spontaneous being: a chicken named Gloria. Based on thousands of requests from deprived Chicken Fries fans, Chicken Fries were brought back in the summer of 2014 for a limited time in BURGER KING® restaurants. After a few months, fans had purchased them all. Since then, executives for the BURGER KING® brand have agonized over the decision of whether or not to bring them back. Starting today, Gloria, the unbiased bird, will make that tough call. She is going on the national Random Gloria tour in her custom-designed coop to determine if Chicken Fries will be available at certain BURGER KING® restaurants. Kicking off in the New York area, she will make her way across the nation, stopping at select locations with bursting contingencies of Chicken Fries fans. 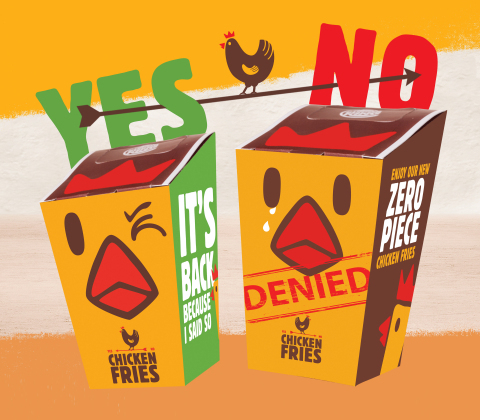 Chicken Fries enthusiasts are invited to come cheer on Gloria in person or watch the live stream at www.chickenfries.com as she makes her decision. Each day when she arrives with her expert handler, she will ascend from her plush coop onto her custom decision-making stage and randomly choose whether or not Chicken Fries will return to that BURGER KING® restaurant. It's simple – if Gloria chooses “yes,” Chicken Fries will be on the menu at that location. 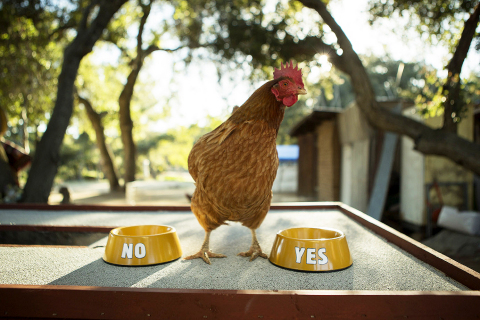 If she chooses “no,” sorry, no Chicken Fries that day. Like it or not, Gloria has the final word. She can’t be bought, seduced or swayed. After the decision, fans can take celebratory or sad-face photos with her. Follow the Random Gloria tour with #RandomGloria, #ChickenFries and on www.chickenfries.com. Chicken Fries are made with white meat chicken coated in a light crispy breading seasoned with savory spices and herbs. Shaped like fries, Chicken Fries are perfect to dip in any of the BK® restaurants delicious dipping sauces including BBQ, Honey Mustard, Ranch, Zesty, Buffalo and Sweet & Sour.